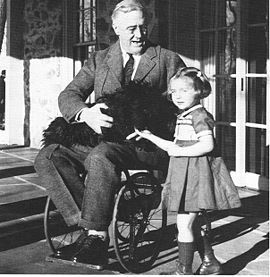 One of only a few photos of FDR in his wheelchair. As I watched Ken Burns’ marvelous documentary, “The Roosevelts,” I couldn’t help but notice just how different the role of the national media was at the time. As a public relations practitioner, I am fascinated in particular by the fact that the media entered into and honored a gentlemen’s agreement with Franklin Delano Roosevelt (FDR) and his staff to never publish a photograph of the president in his wheelchair or leg braces. While most Americans at the time knew that FDR had been afflicted by polio at age 39, few actually realized that as a result he was left paralyzed. This was due in large part to the media not publishing those types of photos, but also to FDR’s dogged commitment to hiding his disability when campaigning. FDR was worried that his disability would make him appear weak in the eyes of the American public. He was known to arrive so early at events and speeches, that crowds rarely ever saw him being lifted out of cars or ‘walking’ up to a microphone. Clearly, the lack of television and social media also helped keep FDR’s secret. He was anything but weak. But could he have stayed in office to accomplish so much had his disability been exposed early on? The White House press corps acted similarly during John Fitzgerald Kennedy’s presidency. Though it was common knowledge among the media that President Kennedy had many romantic dalliances, the American public didn’t come to know about them until decades later. So when did things change? When did the media stop adhering to the concept that politicians had a public life and a private life, and that the latter was thought to be inconsequential to the former? Today, it seems that the media can’t do enough to expose politicians, athletes, celebrities and business leaders at their most vulnerable and weakest times. This is not a criticism. No one can escape the media’s magnifying glass, yet there are still plenty of folks who say that the media is not uncovering enough. I’d say Anthony Weiner, Ray Rice and Adrian Peterson would disagree. So just how much do we need to know about today’s political leaders or about our favorite celebrities and athletes? Are we somehow expecting complete perfection? Where is the balance between knowing too much and not knowing enough; and what is the media’s role in delivering this? These are questions that I’m not certain of the answer. I’d love to hear your thoughts on this. P.S. One final thought: do you think today’s media would have ever have agreed to FDR’s request? I don’t think it is possible for the media to control information presentation in today’s day with the internet. Someone’s cell phone can capture anything and everything these days. Privacy is a thing of the past, unfortunately. Paparazzi have no scruples. It is a fascinating documentary. Thank you SLV.